In this episode our host, Jordan Samuel Fleming, introduces us to Supercharged! the brand new podcast focussed on the power of automation and workflow management with Citrix Podio. Jordan introduces the background of the podcast, and explains some of the challenges that new Podio users have when they first get introduced to Podio…which is why he started this podcast! He also introduces the first guest on Supercharged! Andreas Huttenrauch, founder of GlobiFlow, GlobiMail and Procfu! [00:00] Get ready for another episode of supercharged with Jordan Samuel Fleming, your weekly dive into the awesome impact workflow and automation you can have on your business when it’s powered by Podio, June, as each week, as we learn from the top Podio partners in the world as we investigate system integrations and add ons and hear from real business owners who have implemented Podio into their business. 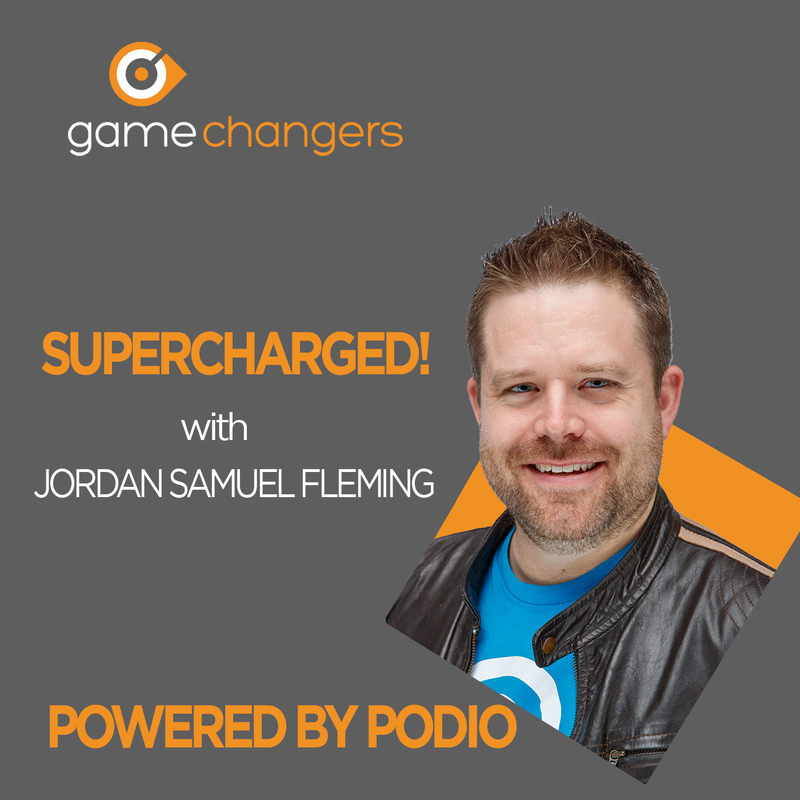 Now join your host, Jordan, Samuel Fleming’s CEO of Gamechangers for this week’s episode. [00:35] Hey everybody and welcome to this inaugural episode of supercharged. I’m your host, Jordan Samuel Fleming, and in this pre-episode I want to talk a bit about what the focus of this podcast will be, why I’ve started it and where I plan to go with it. So this weekly podcast is going to focus on the incredible power that workflow and automation has on your business in particular around the automation workflow provided by Citrix Podio. Now I’m going to focus on three specific types of episodes. Each will be around 30 minutes to give you a quick hit on some information that will help your business. The first type of episodes are going to be partner profiles now, and these episodes, I’m going to invite on different Podio partners from around the world to learn firsthand about how they’ve implemented Podio, uh, how they got into Podio and the first bit the type of customers they work with, some of the key systems they’ve defined and their key hints and tricks that they can’t live without. [01:31] A podium. Partners have a great experience working with all sorts of different organizations and business sectors around the world. So these episodes I’m hoping will give you a good flavor of different opportunities that Podio and workflow automation provide. The second type of client stories in these episodes. I’ll be interviewing different companies around the world that implement Podio and use it on a daily basis. I want to know what impact it’s had on them, where they are, what they’ve learned about how to implement it, and the challenges they faced as they try and change from system to systems. And finally, uh, the add on world where we’ll be focusing on specific bits of technology that can be linked with citric Podio and can really improve your workflow automation. These can be both official Podio, add ons as well as other systems that we’ve integrated either via the API or systems like Zapier or Integromat. [02:25] So I’ll be your host every week. My name is Jordan Fleming. I’m the CEO of Gamechangers. We are a Podio partner. Uh, we’ve got teams in Asia, Europe and North America and we work across about, at this point probably 16 different countries, uh, everything from local government agencies to large multinationals down to mom and pop organizations. I’m also the CO founder of smartphone, which is the first voip phone system that was created specifically for Podio and the founder of boost pm, which is a and automation system for property management companies. Now, the reason I started this podcast is really there’s a huge amount of people who are interested in workflow automation and on the facebook forums and groups. I keep getting the same kind of questions asked me, what can Podio do, a, you know, how am I best to get started? [03:21] Uh, what, what are my options for getting Podio designed for my particular business? So I thought this podcast on a weekly basis would be a good opportunity to answer a lot of those questions. Um, Podio is probably one of the most powerful workflow and automation tools out there. I’ve yet to find a system that can do as much as many things as we can get you to do. Um, but the challenge of Podio is always the same. Uh, if you’re new to Podio, there’s nothing there until you build it. Um, you know, Podio is not a crm. It’s not a project management tool. It’s not an asset management tool. It’s not a finance tracking tool. It’s none of these things. And it’s all of these things. And that’s the real challenge of Podio. Podio is a platform, not a software system. When you think of software system, do you think of things like salesforce or pipe drive or infusion soft? [04:12] Those are systems that are what I would class as boxed off their systems that do a specific thing in a specific way. Now you can do little bits of customization here and there. You can, you know, you can change some things, changed fields maybe even changed some of the processes, but, but ultimately they’re designed to do what they’re designed to do. A salesforce is really bad at managing projects. It’s very good at managing the crm and sales pipeline. Um, you know, uh, Asana does project management relatively well, but it’s very, very poor at automation. It’s very poor at workflow and a can’t do crm. So the challenge that we have with Podio is most people come to Podio thinking about software box software and in truth, because Podio is a platform, you can build it to do anything and that is one of its greatest strengths, but also its biggest weaknesses in terms of how it’s marketed and how people who are not familiar with it, I’ve come into contact with for the first time and understand, you know, how to actually use it. [05:17] One of the things that we find that we can often solve with Podio is this notion of multiple systems. So I went back and I talked to you about, you know, I mentioned a Santa and sales force and pipe drive and infusionsoft. One of the things that the software service market has opened up over the years is, are all these different software systems that you can access to online, right? Uh, and they’re suddenly giving you really enterprise level capability at a relatively modest monthly price, right? I mean, salesforce is a very, very powerful crm and you can reach it for about 90 pounds or 100 bucks a month. That’s unbelievable considering what a, a complex system it actually is. Um, the problem is it’s created a situation where many businesses are having to interact with five or six or seven or eight different systems to manage the different parts of their business on a daily basis. [06:24] So they may use slack as a communication tool internally, and they may use salesforce as a crm or maybe pipe blood drive. They may use a sauna or Trello is project management and they may use zero or quickbooks is finance, they may use, um, you know, infusion soft is a marketing automation tool. They may use Zapier to integrate some bits and pieces here and there and it starts to blow it up and blow it up. Now that’s a problem, not just from a cost perspective because of course, all of these things carry a monthly cost to them, but it’s also a problem from a efficiency, a noise factor and a staff training in an upkeep, a point of view. If you are having to do your work across, you know, eight different systems, uh, your efficiency on a daily basis is, is, is seriously going to be a contracted. [07:19] One of the things that, that Podio does so well is the fact that you can build all this functionality into one system and make sure that the data is all contained within one ecosystem as opposed to, you know, six, seven or eight. Um, so one of the things that I’m hoping to do with this podcast is really to try and give people a real understanding of the basics of how Podio can be, uh, dealt with, can be built and can be continuously expanded. That’s the other kind of key thing that I think is important when you talk about Podio is you can start small and then grow. Um, a lot of our clients will start with the first phase development where we identify three or four key things. We want to, uh, you know, accomplish key business functions we want to bring in and then move on to a second or third phase as we expand that system to do more things. [08:10] That is a real power of polio because not only are you able to expand it from a functionality point of view, but also the more people use Podio, the more they realize it always works the same way. So because Podio always looks and acts the same way, you can expand its functionality and I’m bringing in all sorts of different business processes and once your staff have a good grounding in it, then they know how it works and you can add in new functionalities and new entire business units and they will understand kind of intuitively how it works because it always works the same way. Um, so I’ve got a weekly podcast being scheduled. Now we’ve got our first episode that’s going to drop a with Andreas, uh, the founder of Globiflow, um, obviously flow if you do use Podio. Globiflow is the automation tool that you love and, and rely on for everything. [09:07] I’m Andrea sold Globiflow to Citrix and has now got a two plugins, ProcFu and Globimail, which he is a kind of focused on now and we use both of them. Um, and then I’ve also got a network of Podio partners that are gonna start to do podcasts with us over the coming weeks and including a Gil Roberts who has his own podcast, which is awesome. And I highly recommende it. You can reach that on the Podio forums and it is a, an excellent opportunity to go a bit deeper into the type of work that they do in Podio and to look at more enterprise level things that they’ve done with clients and that they are planning to do. They’re also going to do more deep dives into some specific types of automation so it’s more of a technical bit, whereas this is going to be much more about discussing and interviewing people. [10:02] So two really good resources for you to take advantage of within the Podio Ecosystem system. We’ve also of course going to have some Citrix employees on as guests, people who work within the s, the Citrix Podio environment but also work within maybe the wilder wider share file, right signature and a workspace environment Citrix to show how some of these Citrix tools work together so well. So I hope everybody enjoys it. Um, obviously we’re going to be doing a making changes to the format will be upgrading, it will be giving interviews with all sorts of different people. So I’d value your feedback and of course if you are using Podio, if you’re a partner, if you’re an integrator or simply an end user and you maybe think that what you have in built in Podio is valuable, then please drop us a line at www dot. 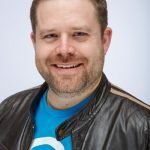 We are Gamechangers.com and we can schedule it for a podcast appearance. We’re really keen to show as wide a spectrum as possible. So, uh, thanks very much. I look forward to, uh, interviewing as many people as I can and getting a varied podcast to show the true power of Podio. Have Great Week.